This year, two students of the HKU Netherlands Carillon School hope to graduate and obtain the first part of their Master Carillon degree. The exams take place on Tuesday, June 19th, are open to the public and can be listened to by everyone. A terrace of one of the pubs on the Onze-Lieve-Vrouweplein right under the tower is an excellent place to enjoy the music. 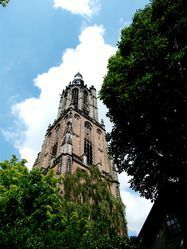 As in previous years, Beiaardcentrum Nederland and HKU Nederlandse Beiaardschool are organising six summer evening concerts on the carillon of the Onze-Lieve-Vrouwetoren. These concerts take place on Wednesdays from 20:00 to 21:00. Ten minutes before the start of each concert, the Amersfoort Bellringers Guild provide a festive prelude. You are cordially invited to the presentation of Jacob van Eyck’s Der Fluyten Lust-hof arranged for carillon by Arie Abbenes taking place on July 2nd. 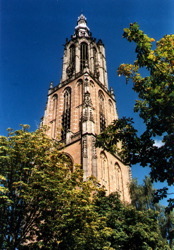 Jacob van Eyck became the carillon player of the Dom Tower in Utrecht in 1625. He also entertained passersby by playing on his recorder from the Janskerkhof. His music for recorder was published in the Lust-hof; it is not known if he wrote music for the carillon. What would he have played on the carillons of the Dom Tower, de Janskerk, de Jacobikerk and town hall? Her Royal Highness Princess Beatrix of the Netherlands opened the exhibition ‘Featured: Stories from the City Palace‘ on the morning of Friday June 15th at the Royal Palace Amsterdam. 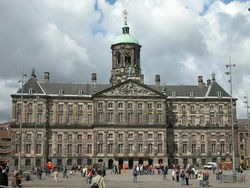 The Royal Palace - in the heart of Amsterdam for 370 years and until 1808 the city hall of Amsterdam - was designed by architect Jacob van Campen as a building that reflected the great power and wealth of Amsterdam in the seventeenth century. 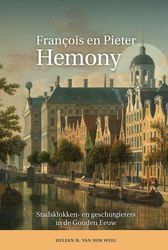 The Historical Reading room of the Peace Palace Library in The Hague was host to the book launch of “François en Pieter Hemony, Stadsklokken- en geschut gieters in de Gouden Eeuw” by Drs. Heleen van der Weel on the 31st of May 2018. Van der Weel studied history, was employed as the city carillonneur of The Hague for many years and still regularly plays the carillon at the Peace Palace. 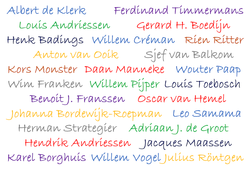 The Dutch Carillon Association (NKV) was founded on June 20th, 1918. To celebrate its 100th anniversary, Dutch carillon music from within this period will be played on many carillons during the week of June 18th-24th. Thus original compositions for carillon will be featured that have been written since 1918.